The metal egg crate grille is a popular choice for commercial and domestic situations. This vent is normally installed on a ceiling because of it's deep design, however can be installed in walls if the dimensions are suitable. The Linear slot vents are a popular choice for modern bathrooms. They are available in four sizes. An adaptor box is also supplied, which is required to connect the vent to 150mm ducting, and for ease of installation (see Dimensions tab for back view). The Builders Choice, Anodised Aluminium vent is designed for wall installations, however it can be installed on a ceiling. Vermin proof mesh is built into the vent. The vent is to be installed with a square to round adaptor, which is included in this price. The 304 grade Stainless Hood vents are suitable for external wall installations. This style of vent provides a greater protection from the elements. 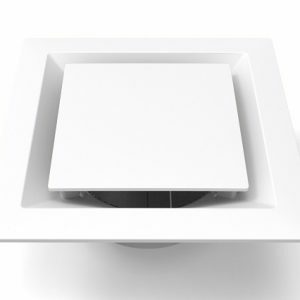 Australian designed low profile ceiling diffuser ideal for any bathroom with its minimalistic design. Featuring quick fit clips and integrated non-return volume control damper allowing for easy installation and low installation costs. The metal square vents have a simple low profile design which makes them a perfect choice for modern bathrooms. Supplied with square to round duct adaptor. The Stainless Steel Mesh Vent is suitable for wall and ceiling installations. They are made of 304 grade Stainless Steel. 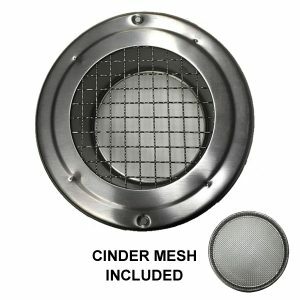 This vent comes with a cinder mesh, which makes the vent suitable for installation in Bush Fire prone areas. 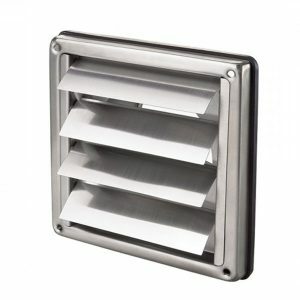 The 304 grade Stainless Dome vents are suitable for external wall installations. This style of vent provides a greater protection from the elements. An inside vent/grille for use with exhaust fans. It is normally placed on the ceiling or wall. It comes in different sizes, to match the duct used, and the air flow is adjustable: the centre part is rotated clockwise or anti-clockwise to open or restrict airflow. An inside vent/grille for use with exhaust fans and is normally placed on the ceiling or wall. An inside vent/grille for use with exhaust fans – normally placed on the ceiling or wall. 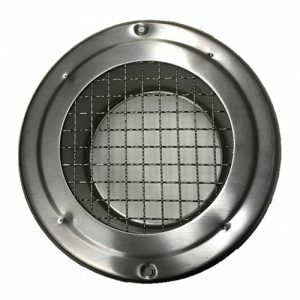 This stainless steel cone vent comes in different sizes, to match the duct used, and the air flow is adjustable: the centre part is rotated clockwise or anti-clockwise to open or restrict airflow. A vent/grille for use with exhaust fans. It is normally placed on the outside wall. It has gravity flaps that opens up when the fan runs (the fan blows the flaps open with the air it pushes). It is ideal for keeping insects out. In windy areas, the flaps can move due to the wind creating some noise. This is a 150mm vent, it is a grey colour and has been treated to be safely placed outside.